The concept of “Good enough” draws mixed reactions from people. While some say good enough isn’t good enough and we need to exceed customer expectations. Others argue for it more from the point of view of launching a good enough product on time vs. waiting for perfection. When it comes to product management and product design do we go with far superior features than what is available in the market or just checking the box will do? Does either one guarantee defending or expanding market share? The simpler way to approach this conundrum is to understand the value step function. 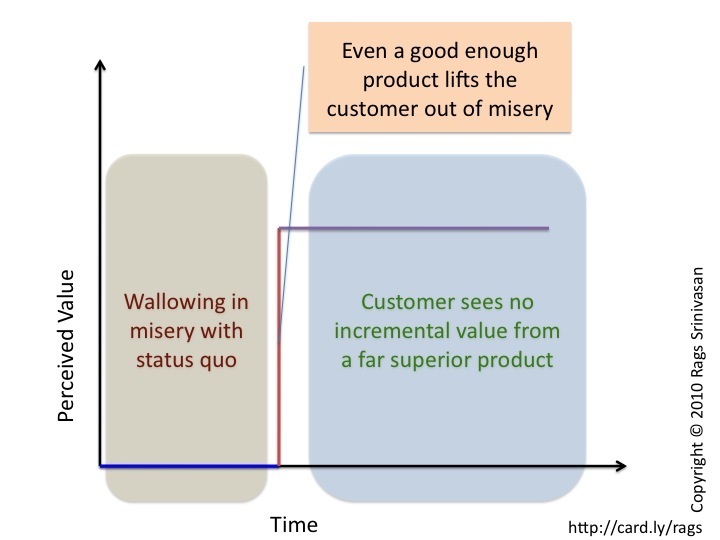 Value perceived by customers is not a linear function of product features. Value is a step function – an initial package of features causes a step increase in value perceived but after that point it can level off for a very long time or until another shift occurs at which point it makes another step jump. We have seen the similar product strategy from Galaxy before. Improved camera, longer battery life, better screen etc. are all good, but do these matter on the plateau portion of the value step function? As customers see no incremental value in this part of value curve, none of these improvements will help with market share. If a marketer want to gain share and drive adoption they need to focus on those value dimensions where the current products are stuck in the valley floor of the value step function. That is what happened when iPhone entered. The next innovation that will dominate the market comes only from focusing on new value dimensions. In this part of value curve, good enough is good enough. May I suggest innovating on a smart phone that is priced at $50? If the 7″ Amazon Kindle Fire can be priced at $49, a phone like that will most likely be a step function in gaining share.